Oil on canvas, 30 x 25 cm. 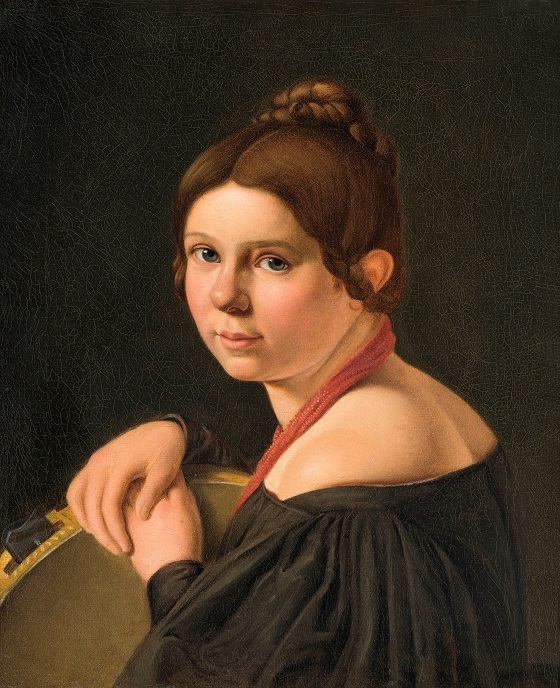 The young Madam Marie Lehmann is depicted as an Italian woman with a tambourine in this portrait. With her body turned the other way, the graceful woman looks back at the viewer with a warm expression and a smile on her lips. Together with her parents Bolette and Hans Puggaard and her husband Orla, Marie Lehmann belonged to a circle of bourgeois patrons who provided financial support to Danish Golden Age painters such as Wilhelm Marstrand, Jørgen Roed and Constantin Hansen. She visited Rome several times with her family in the 1830s. It is likely that the portrait of her as an Italian woman was painted during one of these stays by the painter Albert Küchler, who settled there.